Following the invitation from Guangdong province officials, the representatives of the Czech-Slovak-Chinese Chamber visited during 26. – 30. September, 2016 the province and some of its most significant regional municipalities. The delegation was aimed to present the activities and plans of our Chamber and to establish new relations with political representatives from the Guangdong province and with the representatives of the most significant commercial companies. 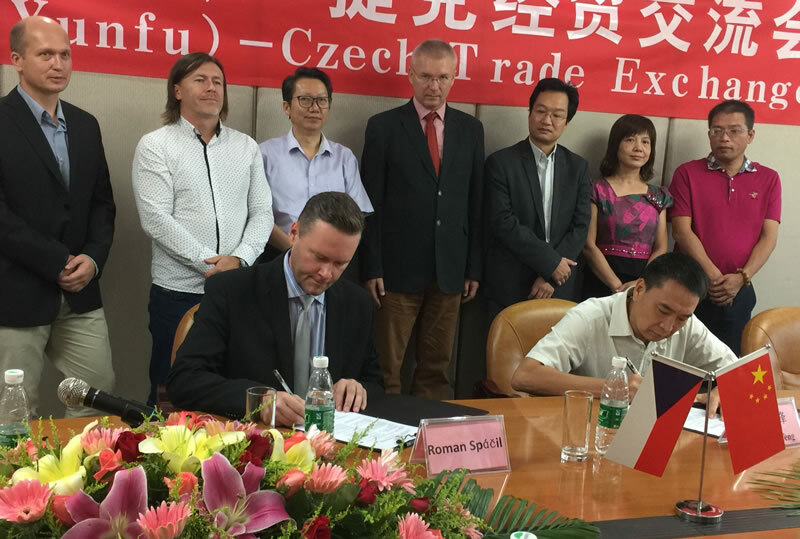 During this short period of time, the Chamber has signed four cooperation agreements with our Chinese partners which underline specific areas of interests for future cooperation between the Guangdong province representatives and the leading Czech companies. The negotiations resulted also in specific tasks and opportunities for Czech companies that want to expand and/or outsource their manufacturing capacities to China. Our Chamber was offered cooperation, support and the possibility of consultations from the top political representatives of the Guangdong province. As the president of the Chamber I was honored to meet in person and in the presence of leading Chinese media with Mr. Hu Chunhua, Guangdong provincial party committee secretary. Mr. Hu has reassured me that the Guangdong province has eminent interest in cooperation with the Czech Republic in the particular areas covered by the cooperation memorandums. We spoke with Mr. Hu also about Doc. Ing. František Čuba (chairman of the Czech significant collective farm in Slušovice and a Senator) because both gentlemen know each other very well. Last but not least, I want to emphasize that as the outcome of the delegation, there were specific negotiations with the top Guangdong representatives whereas our Chamber has obtained an express mandate to intermediate and negotiate with Czech companies, investors, manufacturers and persons interested in cooperation with the Guangdong province.